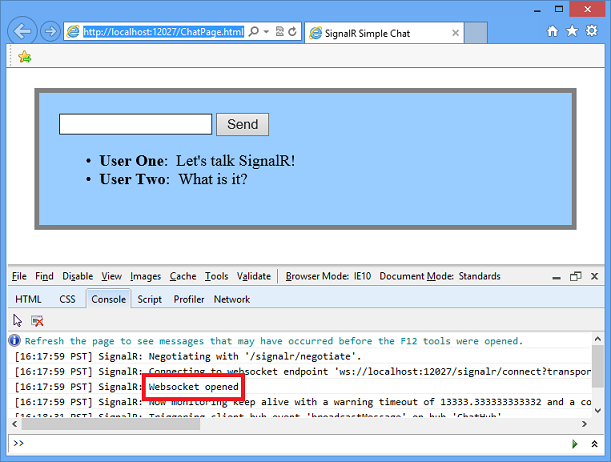 This article describes what SignalR is, and some of the solutions it was designed to create. 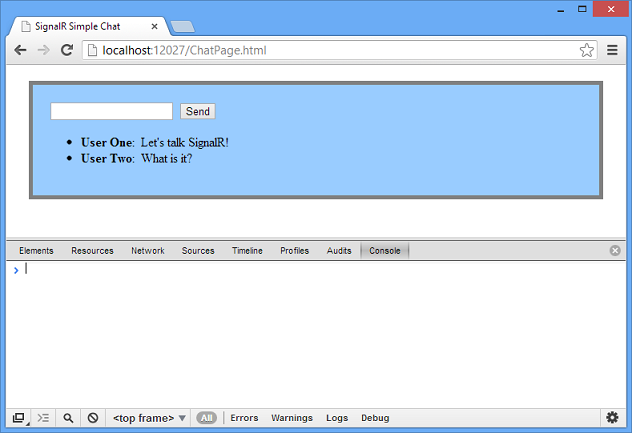 SignalR uses the new WebSocket transport where available and falls back to older transports where necessary. While you could certainly write your app using WebSocket directly, using SignalR means that a lot of the extra functionality you would need to implement is already done for you. Most importantly, this means that you can code your app to take advantage of WebSocket without having to worry about creating a separate code path for older clients. SignalR also shields you from having to worry about updates to WebSocket, since SignalR is updated to support changes in the underlying transport, providing your application a consistent interface across versions of WebSocket. Forever Frame (for Internet Explorer only). Forever Frame creates a hidden IFrame which makes a request to an endpoint on the server that does not complete. The server then continually sends script to the client which is immediately executed, providing a one-way realtime connection from server to client. 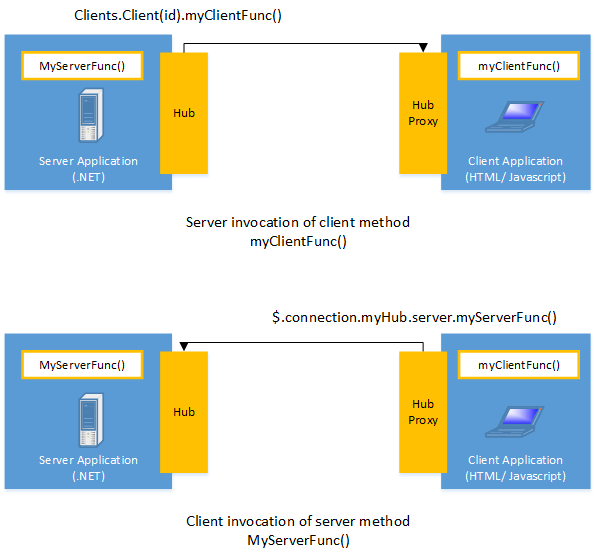 The connection from client to server uses a separate connection from the server to client connection, and like a standard HTTP request, a new connection is created for each piece of data that needs to be sent. The following list shows the steps that SignalR uses to decide which transport to use. If the browser is Internet Explorer 8 or earlier, Long Polling is used. If JSONP is configured (that is, the jsonp parameter is set to true when the connection is started), Long Polling is used. The client supports CORS (Cross-Origin Resource Sharing). For details on which clients support CORS, see CORS at caniuse.com. If any of these criteria are not met, Long Polling will be used. For more information on cross-domain connections, see How to establish a cross-domain connection. If JSONP is not configured and the connection is not cross-domain, WebSocket will be used if both the client and server support it. If either the client or server do not support WebSocket, Server Sent Events is used if it is available. If Server Sent Events is not available, Forever Frame is attempted. If Forever Frame fails, Long Polling is used. With the console open and logging enabled, you'll be able to see which transport is being used by SignalR. A Connection represents a simple endpoint for sending single-recipient, grouped, or broadcast messages. The Persistent Connection API (represented in .NET code by the PersistentConnection class) gives the developer direct access to the low-level communication protocol that SignalR exposes. 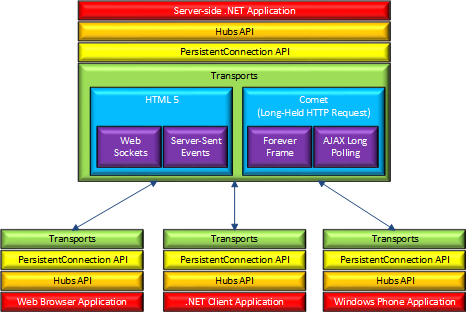 Using the Connections communication model will be familiar to developers who have used connection-based APIs such as Windows Communication Foundation. The method call can be monitored using tools like Fiddler. 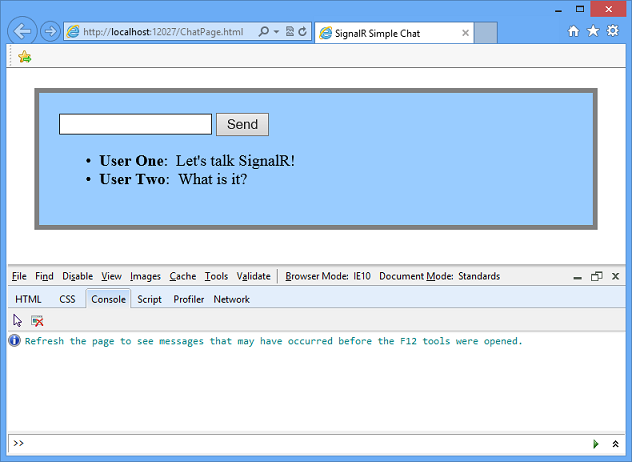 The following image shows a method call sent from a SignalR server to a web browser client in the Logs pane of Fiddler. The method call is being sent from a hub called MoveShapeHub, and the method being invoked is called updateShape. In this example, the hub name is identified with the H parameter; the method name is identified with the M parameter, and the data being sent to the method is identified with the A parameter. The application that generated this message is created in the High-Frequency Realtime tutorial.